The space for rent in the mansion is lovingly referred to as "The Chapel." This space has it's own separate entrance. As you arrive, you will be welcomed in to a warm and inviting vestibule. The room then opens up to one of the grandest residential living spaces in the city of Plattsburgh. Gold leaf paint, extremely tall ceilings and windows, new hardwood flooring, reminiscent of the era in which the home was originally constructed. The ceiling boasts artwork by William Morris Hunt, commissioned in the 1860s. Columns run along the second story balcony, overlooking the living space down below. There is a huge walk in closet with plenty of natural light, and a shoe cabinet to die for. The bathroom was newly expanded and remodeled, featuring classic honeycomb black and white tile flooring, with a large subway tiled walk in shower. Take a soak in the vintage claw foot tub, and adjust the lighting on the chandelier to create the most perfect relaxing atmosphere. We live in the home, so if there are any questions or concerns, we can accommodate you as quickly as possible. There is not a full kitchen, only a medium sized refrigerator and a microwave. Wi-fi and cable available. Smart tv and DVD player as well. During the Battle of Plattsburgh, Samuel Lowell's wife was held captive by British soldiers at their headquarters, the Boynton Farm. During her time with the solders, she was forced to work as their personal cook. Rumor has it that Mrs. Lowell, during her forced-labor, hid a keg of British payroll gold in a nearby water-well. After the British left Plattsburgh and Mrs. Lowell was let go, she and her husband dug up the gold and with it moved to the other side of the city where they built this beautiful brick federal style establishment. In 1825, Mr. Lowell decided to add the two story addition on the east side. The home was passed on to Lowell's only daughter 20 years later. In 1863, she sold the lot to S.P. 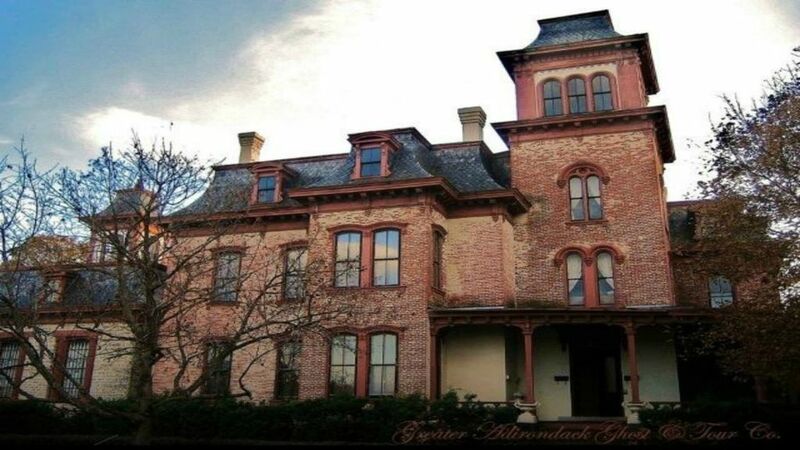 Brown who literally doubled the size, adding the West wing as well as the Stair tower, the painted murals on the walls and ceiling, and changed the outside appearance to fit the popular “Italianate” style. Seven owners later, my business partner and I bought the home in December of 2014. We took the existing home (which was converted to apartments in the 1980s) and we are currently restoring the entire thing, one section at a time. The original pieces are being revived and the pieces that cannot be revived are being replicated. The property has since been used for multiple media projects. (Including the first season of “If These Walls Could Talk,” Season 14 of “Renovation Realities,” scenes from an Independent film shot from a filmmaker at UVM in Spring of 2015, and multiple photo shoots for companies, and musicians. Downtown Plattsburgh is just a few short blocks away, as well as the marina, and walking/bike path. toilet, tub, shower, Completely remodeled and new. Large walking in shower, double bowl sinks, and claw foot tub. Walking distance to downtown Plattsburgh. Centrally located for Fireworks, parades, city events, etc. Home is located just one block from Lake Champlain.